I love Andrea Cremer's NIGHTSHADE series (the original, the prequel, and the new legacy follow-up). She's a fantastic, intelligent writer who creates depth to the worlds she builds. Her newest series is her upcoming steampunk coming in April. Thanks to the generosity of publishers at NCTE & ALAN, I ended up with a second copy of the ARC for THE INVENTOR'S SECRET, and Andrea generously signed it for me to use as a giveaway on the blog. Thanks to Philomel/Penguin and Andrea for this giveaway! 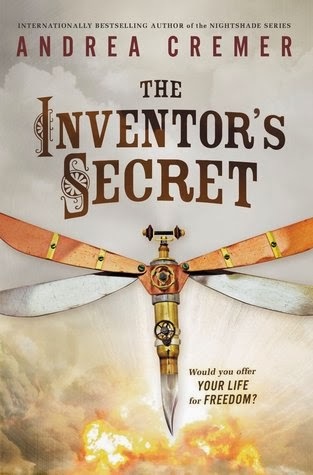 win a SIGNED ARC of THE INVENTOR'S SECRET by Andrea Cremer! Steampunk! Yes! I'm a big fan of her other books, so I can't wait to read this one! I think I'm mainly looking forward to this novel because it's by Andrea Cremer, and I have loved every book she has written thus far. Plus, hello...STEAMPUNK! I love the touch of romance Andrea adds to her books! I can't wait to read a Steampunk book. I have several of my students who are ready for all that they can get their hands on!!! I'm definitely looking forward to the steampunk and historical aspect!